1.5kg fresh young Spinach Leaves. 2. Rinse the spinach, then depending on the size of your saucepan, cook for a few minutes in batches over a medium heat with a little water stirring once or twice until the spinach is wilted. paper or a clean tea towel, cool. 4. Put the cooled spinach into a bowl with the spring onions, parsley, dill, feta and ricotta then add the nutmeg and season well. Mix using your hands until well combined then add the eggs and mix again. 5. Brush your tin with olive oil and lay a sheet of filo lengthways making sure that while you work the remaining sheets are kept covered so they don't dry out and break. 6. Brush with more oil and add another 5 layers of pastry brushing with oil between the layers. 7. Lay on two further layers, crossways this time, also brushing these with oil. 8. Spread the filling evenly into the pastry lining then fold over the crossways layers and the edges from the long pieces. 9. 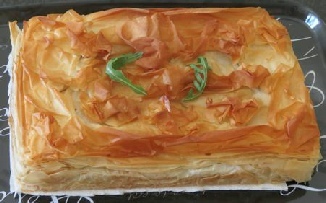 Cover the top with the 5 more layers of filo, brushing with oil as you go; then brush the top with oil. 10. Use the 13th sheet for decoration by scrunching up oiled pieces and placing on the top of your pie. 11. Bake for 35-40 minutes until golden brown. 12. Cut into squares and serve warm.